Omega Protocol just funded. But there's 15 days to go and some of the EU-peeps are really unhappy about the cost of the shipping... So I expect some yo-yoing to happen. I hope the total stays above 100.000 in the end as I want the extra cards and stuff for the game. Were they going to do any stretch goal bonus stuff for Omega Protocol? Or just keep it as is? Upgraded rulebook with new LOS rules, few new maps, new monster stats (same old models, variant stats), new or newly balanced gear cards. And the KSE female leader model ( variant model for the team leader). So, basically same game, but a bit of polish added to the rulebook. Game 2.0. This KS is just a new chance to get the OOP game, really. EDIT: here are all of the planned new stuff. ya, no stretch goals as privateer said they wanted to hit their delivery time. Also this won't be going back into retail channels. Tee shipping costs they've stated will go down as they get more and more backers in europe so the listed costs are worst case as they'll be renegotiating those costs once they know what the bulk amount will roughly be. I'm not one of the EU-peeps complaining about the shipping costs, altough I'm propably paying the same amount of money to ship as I'm paying for the upgrade. Good thing I already own the game and the expansion though. Shipping costs for those are a bit steep. Not sure if this is the right place to ask, but MonPoc is a PP property, so I figured it wouldn't hurt to bring it up. So is PP gonna re-release the Elemental Champions, Empire of Apes, Ubercorp International, Tritons, Savage Swarm and the Subterranean Uprising factions for MonPoc 2.0 sometime in the near future? Also, do they plan on releasing any new factions after that? I heard through the grapevine that PP was spit-balling ideas for a hypothetical block three consisting of demons, dragons, attack of the fifty foot woman, 1950s style robots, zombies and plants. Though feel free to take that with a grain of salt if you don't believe that. Just got a MonPoc starter set today, so I'm excited about that. No doubt they will at some point. Most of the game is the same, and a lot of those models now can be used with more stuff. I have heard that due to new version of the game being more Alliance focused vs indivigual Factions that we should actually see the old second wave Factions start showing up after the second monsters from the first, rather than getting the full roster out first. Vertrucio wrote: No doubt they will at some point. Most of the game is the same, and a lot of those models now can be used with more stuff. Thanks. I've heard through the grapevine that some old ideas PP had for a hypothetical third wave of MonPoc 1.0 factions consisted of a demon faction, a dragon faction, an "Attack of the Fifty Foot Women" faction, a 50's "Robbie the Robot" style robot faction, a zombie faction and a plant-based faction. What other kaiju based tropes do you think they could use to create new factions? Personally, the only other ideas I could think of (or saw someone else post about as of this writing) for new kaiju factions are Angels (who would be archenemy's with the Demons, obviously), aliens from Venus, Golems and Slime monsters. AduroT wrote: I have heard that due to new version of the game being more Alliance focused vs indivigual Factions that we should actually see the old second wave Factions start showing up after the second monsters from the first, rather than getting the full roster out first. So what you're saying is that wave 2 of MonPoc 2.0 would consist of new faction concepts while the wave after that would reintroduce old wave 2 factions (Ape Empire, Tritons, Subterraneans, etc.) from MonPoc 1.0, right? If yes, yeah that makes sense from a business perspective. You'd want to show off what the second edition has to offer before you go back to introducing old fan favorites first, otherwise what would be the point of making a new MonPoc edition in the first place? Honestly, if they ever made a third edition for MonPoc, I wouldn't mind if they brought back the Radicals, Collaborators, Invaders and Fiends agendas if they made them into sub-agendas within the wider Protectors and Destroyers agendas/alliances. They may decide to do the series 2 stuff in different Agendas as well. Tritons/Swarm/Subterrans as Invaders, Elementals/Uber/Apes as Radicals or something like that. The game has always been something of a hodgepodge in terms of faction composition, but the move towards 2 monster games makes more sense of it, IMO. I think if anything, we'll likely see more synergies between monsters and units the way we see with Terra Khan to tie in what you bring with what's in the army. So with that agenda setup, Collaborators and Fiends would be out of the picture? Is this something PP has confirmed themselves or is that just speculation on your part? Which is fine, I'm just wondering where that idea came from. Isn't the absolute maximum amount of monsters one can field in MonPoc three? Though I've heard two is the preferred number for the competitive scene. What new types of factions would you like to see in MonPoc? The official rules list set ups for one, two, and three monster teams. The tournament rules recommend two. Not my thing at all, but I really like them. The narrative associated with them really sounds like one of the most compelling things to happen in the setting in a while. Curious how the campaign works out. The monpoc faction changes are surprising, but lots of exciting stuff there. Mostly just want my bugs though. 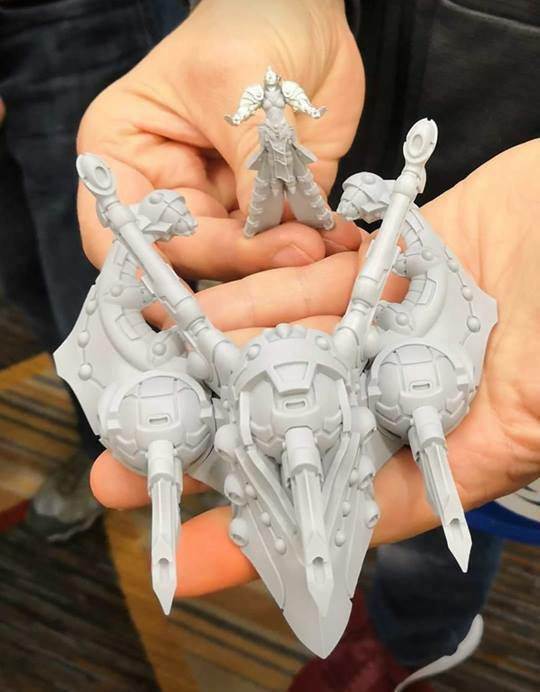 Ohh as a Tyranid and Everblight fan the new Infernals look VERY neat! Really liking the L5R stuff. I wish they'd just do an official line that isn't a one off thing like the minicrate is. At least I've had good luck plucking up the figures I like on the aftermarket for not a whole lot more. Infernals sound fun. Previewed model makes me think of the Kingdom Death Watcher. I may have to get that Metal Slug- inspired pygmy tank for Riot Quest. Hopefully it's a Khador unit! Aw shoot! It's a pygmy as in Troll pygmie! Even better! I got rid of most of my Privateer stuff- except for a lot of Trolls. If that art book is big enough, and if the price is decent I can see myself picking it up. I wanna see the art for that infernal combat Master. All the Riot Quest models will have full Warmachine / Hordes rules. The Artbook is a kickstarter. And the Iron Maiden is one of the rewards I think. I am hopeful for the mentioned fabric MonPoc maps because I hate the folded paper ones. If the quality of their minis has improved since those not that great Grymkin figures I picked up a couple of years ago, I'll be all over those Riot Quest ones. They've moved away from the rubbery mass plastic stuff to in house resin. It's more brittle but holds detail better. Yay! Their PVC offerings needed way too much prep-work. I really hope this is the start of PP pulling itself together after a few bad choices hit all at once! Pretty enthusiastic about MonPoc. Better maps, new buildings, getting to the other factions quickly - all good news. I think Oblivion looks pretty good too. I think it has been too long since PP did one of these kinds of books, and it has been missed. It probably won't be popular with tournament-style players, but I'm thrilled that PP is finally starting to push WMH as a game about more than tournaments. Riot Quest... I just don't get. It seems to be a small scale board game, in the spirit of Aristeia and Warhammer Underworlds, but the tone of the game seems at odds with WMH, while still being a part of WMH? I think I'm going to have to reserve judgment on that one. One thing PP's really got down is using resin for large pieces but using metal for small details. Of the resin figures I've worked with, they are by far the least brittle because of this. I think Riot Quest is at worst following the model of GW's side games like Speed Freeks and Warhammer Underworlds. They want it to succeed on its own merits, but if it doesn't, it should still sell as WM/H players are going to want the minis anyway. I really wish PP would stop with their exclusive or bundled models. Every timeI want to consider giving them money for the first time, I realize the model is part of some unnecessary fad-chasing bundle or random exclusive or whatever. What a mess.